...the second set of slightly smaller, feminine-type footprints. So, thinking...need to escape from your current situation for good? For a while? Need to take a blogging break? Love Bowie.... Seriously - I would marry him. One night a man had a dream. 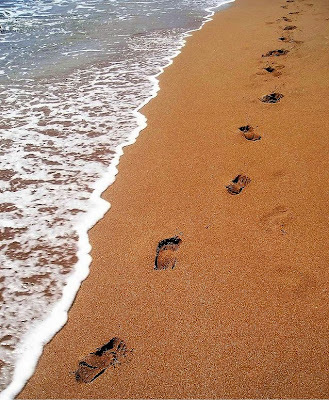 He dreamed he was walking along the beach with the LORD. Across the sky flashed scene from his life. He noticed two sets of footprints in the sand. 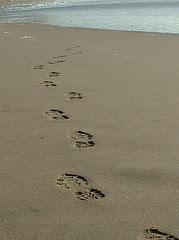 When the last scene of his life flashed before him he noticed that many times there was only one set of footprints. He also noticed that it was at the very lowest times in his life. He questioned the LORD about it. "LORD, you said that once I decided to follow you you'd walk with me all the way. But I have noticed there is only one set of footprints. I don't understand why when I needed you most you would leave me." When I looked at the calendar yesterday, I thought "Where in the hell did this month go????". So what are YOU thinking, V? Perfect photos, and great Bowie tune (but where is Sam & Dave?). Great music and pics Vince... makes me want to hop on a plane and head for the beach... sand in my toes, sea breeze in my hair... heaven! TRAVIS: My good friend... your sense of keen observation is right on today. SONGBIRD: Not looking for an escape. Not at all. TISHA: Our friend Dixie has posted that poem a number of times when her friends have struggled. PIA: Now now my friend.. as other have done, that is for you to interpete. And it doesn't surprise me that you picked up on that. Go back and hit your plaer a second time. dude, I'm jonesin' for the beach and this didn't help! hugs! Ahhh those pictures are so timely since the weathe rhere is getting COOOOOOLD. Cheers!! 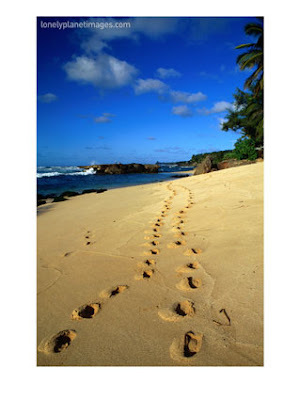 Nice pics....I wanna go to those beaches. I hear ya on that Beach need, Bond. March can not get here soon enough. I am bummed though, can't get the music player to work. Thanks IT department! Now I don't feel so alone. I hope you don't either. oh, I want a beach... still in the negatives here in the morning. Wonderful pictures and great choice of music. Did you know by which situation Poerter was inspired for this songtitle? Hope you are doing well, Vinny, and everything is alright...? Ah Vinny...as I freeze up here in HE Ohio with more snow than all this winter combined and frigid temps! I think of my oldest in Florida minutes away from a beach. MIRANDA: How can oyu not like the beaches.. LOL OK, coming to find out what I am up against. STARRLIGHT: You still have not said you were taking me dear? JULIE: Would they like company? Love your b-i-i-i-i-g comfy couch. I've learned a lesson here: Don't prejudge what you "think" a blog may be about. I thought you were mainly a sports-type blog and I'm feeling really bad that I've been missing out on stuff - like the beach and the music and a guy that likes "Hot Tuna!" We saw them live a couple of years ago - they're great!!! That's an awful long journey by yourself it would seem with the use of multiple pictures of "you" walking alone. Is that what's made this month so long? Hopefully you'll find those smaller footprints next to yours that Travis referenced soon.